Chat on Facebook for BlackBerry | BlackBerry Blast! 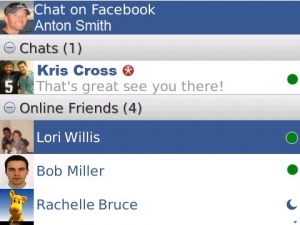 Chat on Facebook for BlackBerry allows you to chat with all your Facebook friends using your BlackBerry smartphone. Chat on Facebook has been modeled after the native Facebook interface, giving you a familiar look and feel for a great experience chatting with your friends. Chat on Facebook is the only native BlackBerry� app for chatting on Facebook, we are dedicated to making the best possible BlackBerry� apps and we will continue to improve Facebook chat app and make free upgrades to our users forever. - Shows online and idle Facebook friends with profile pictures! - You can now login with either your Email, Phone or Username! No need for a username anymore! - Many bug fixes, thanks to our users and your patience while we make the app better! If you like this app please write a great review, it will help us keep improving it and making it better! If you have any problems connecting, please contact support @ smarter-apps . com and we will assist you getting setup. We answer every single support email, so if you contact us we will do everything we can to help you.